Driving in and around metropolitan areas can be a stressful experience. The never ending road construction and heavy traffic congestion can make driving both an inconvenience and an added danger as more obstacles are added into the equation. In areas like Chicago, wintertime driving commonly has an added danger during the dreary winter months as snow and ice can quickly play havoc on driving conditions— and contribute to serious motor vehicle accidents. Advances in safety technology on vehicles and improved snow removal by municipalities has improved the safety of out roads— to a limited extent. Unfortunately, the presence of poor road conditions— commonly with accumulations of snow and ice– is believed to be responsible for a majority of the on-the-road fatalities occurring every year. A study commissioned by the Federal Highway Administration, “On a Crash Course: The Dangers and Health Costs of Deficient Roadways” estimates that road conditions play a significant role in more than 5.3 million auto collisions every year. The study also estimates that road conditions are responsible for $217 billion in damages to property and people. Despite the inherent dangers of winter-time driving, each driver has a responsibility to protect both the occupants of their vehicle and other vehicles sharing the roadway with them. Put another way, the poor road conditions are rarely considered an excuse for causing an accident. The responsibility of commercial drivers, such as truck and bus drivers, to safely operate their vehicle– regardless of the road conditions is similarly apparent under both Federal and State laws. As the operators of commercial vehicles, drivers are required to undergo training concerning both the capabilities of their vehicle and safe operation of the vehicle in varying driving conditions. 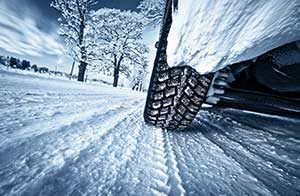 When wintry weather vehicular accidents do occur, a primary defense to these cases proposed by insurance companies and defense lawyers remains that the accident was simply ‘an act of God’– completely unavoidable. Therefore, in order to successfully recover for personal injuries in collisions were weather may be issue, it is important to recognize this frequent defense and fulling investigate all aspects of the crash in anticipation thereof. Rosenfeld Injury Lawyers LLC has a team of accident investigators who can be dispatched quickly to investigate the circumstances following an auto or truck-related accident. Our investigators are trained to ascertain the true causes for the accident. Indeed, road-conditions may be a factor contributing to a crash, but is important to evaluate other variables such as the speeds, weights and distances of the vehicles involved in the collision to determine if the negligence of another driver was similarly to blame.